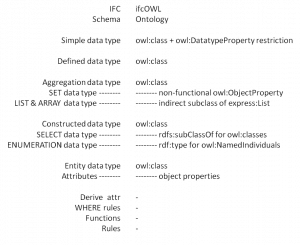 ifcOWL provides a Web Ontology Language (OWL) representation of the Industry Foundation Classes (IFC) schema. IFC is the open standard for representing building and construction data (see BuildingSMART). 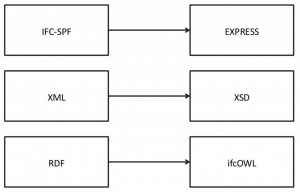 The ifcOWL ontology has the same status as the EXPRESS and XSD schemas of IFC. Using the ifcOWL ontology, one can represent building data using state of the art web technologies (semantic web and linked data technologies). IFC data thus becomes available in directed labelled graphs (RDF). This graph model and the underlying web technology stack allows building data to be easily linked to material data, GIS data, product manufacturer data, sensor data, classification schemas, social data, and so forth. The result is a web of linked building data that brings major opportunities for data management and exchange in the construction industry and beyond. The ifcOWL ontology only imports the EXPRESS ontology. The EXPRESS ontology in turn imports the LIST ontology. The ifcOWL ontologies are generated directly from the IFC EXPRESS schemas. The recommended conversion procedure is entirely open and documented in an LDWG recommandation. The procedure follows the principles displayed in the below schema. Pieter Pauwels and Walter Terkaj, EXPRESS to OWL for construction industry: towards a recommendable and usable ifcOWL ontology. Automation in Construction 63: 100-133 (2016). http://dx.doi.org/10.1016/j.autcon.2015.12.003.